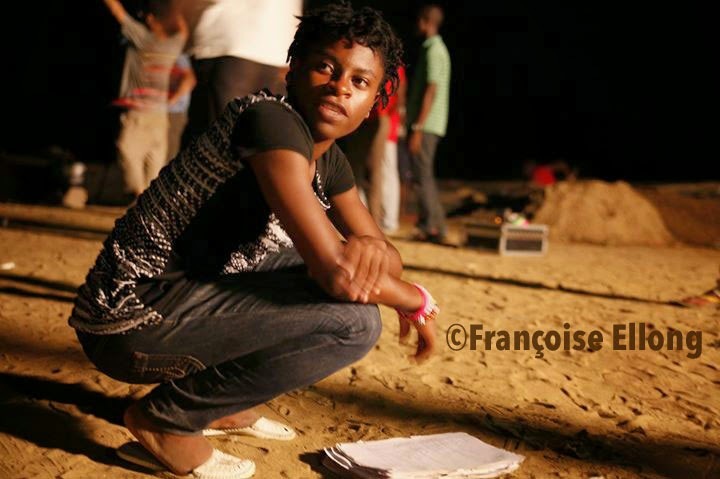 Françoise Ellong was born in Douala, Cameroon on February 8, 1988. As soon as she learned to write, her sense of imagination was revealed gradually to her family. At 11, she arrived in the small town of Brunoy in France, where she lived with her uncle. In 2006 she took her first steps as a scriptwriter but also as director while continuing her studies in Information and Communication in Paris, followed by a Masters in Cinematography and Post Production at the University of Greenwich in London, which she completed with honors. From 2006 to 2012, nine short films emerged from her passion for scriptwriting and directing. Nine films in French and English shot in both celluloid and digital, several experimental and four works, which put her in the spotlight and received awards at several festivals around the world. Among them, NEK, produced in 2010, talks about Nazism and evokes the notion of repentance. The realisation of this short film was a real test for the young filmmaker, who in this film, mixes fiction and historical event. NEK was made in June and screened for the first time in Paris in September the same year. The results two years later comprises of six awards (Bronze Bear in Austria, Grand Prix, Best Picture, Best Sound in Douala, Yaoundé Best Fiction, Honorary Mention for the scenario contest in France) worldwide and several screenings. 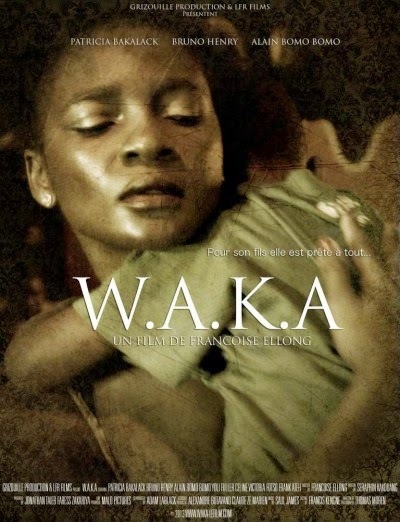 May 2012 marked the birth of the first feature film project: "W.A.K.A". After returning from the 66th Cannes Film Festival, a friend, who is a producer and independent filmmaker, encouraged Françoise to take that final step coveted by all upcoming directors. After several short films shot between France and England, Françoise knew immediately that for this important passage, her desire was to point her camera to the land of her birth: Africa. The adventure "W.A.K.A" is launched. Six months later, despite enormous difficulties, she landed in Cameroon with the script written by Seraphim Kakouang in hand, with the intention to complete the project as an independently produced film. Two years later, "W.A.K.A" already received several invitations to international festivals paying tribute to female directors: JCFA, Burkina Faso, IFC of Doula, Cameroon via the Carte Blanche at Film de Femmes de Créteil, the International Women and Development in Festival Rabat, Morocco. Moreover, the film opened the 17th edition of the Festival Ecrans Noirs in Yaounde, Cameroon, received the Dikalo Award for the first work of a feature film at the 11th edition of the Pan African Film Festival of Cannes in France and more recently, Françoise Ellong found herself among the Greats when receiving the Special Jury Prize at the 17th edition of the African Film Festival of Khouribga, Morocco. Le 8 Février 1988, Françoise Ellong naît dans la ville de Douala au Cameroun. Dès lors qu’elle apprend à écrire, son sens de l’imagination se révèle peu à peu à sa famille. A 11 ans, elle arrive dans la petite ville de Brunoy en France où elle vit avec son oncle. L’année 2006 devient celle de ses premiers pas en tant que scénariste mais également réalisatrice, tandis qu’elle poursuit en parallèle ses études en Information et Communication à Paris, suivi d’un Master en Cinematography and Postproduction à l’Université de Greenwich à Londres qu’elle obtiendra avec mention. De 2006 à 2012, neuf courts-métrages naitront de sa passion pour l’écriture et la réalisation. Neuf films en français et en anglais tournés aussi bien en pellicule qu’en numérique, dont plusieurs expérimentaux et quatre oeuvres qui feront parler d’elles et seront primées à plusieurs Festivals dans le monde. Parmi elles, « NEK », réalisé en 2010. Le film parle de Nazisme et évoque la notion de repentir. La réalisation de ce court-métrage sera une véritable épreuve pour la jeune réalisatrice, qui dans ce film, mêle fiction et événement historique. « NEK » est tourné en Juin et est projeté pour la première fois à Paris en Septembre de la même année. Le bilan deux ans plus tard est de 6 prix (Ours de Bronze en Autriche, Grand Prix, Meilleure Image, Meilleur Son à Douala, Best Fiction à Yaoundé, Mention Honorifique concours de scénarios en France) à travers le monde et plusieurs projections. Mai 2012 marque la naissance du premier projet de long-métrage : « W.A.K.A ». Alors de retour du 66è Festival de Cannes, elle est incite par un ami producteur et réalisateur indépendant, à franchir cette ultime étape tant convoitée par tous les réalisateurs en devenir. Après plusieurs courts-métrages tournés entre la France et l’Angleterre, Françoise sait d’emblée que pour ce passage important, son souhait est de poser sa caméra sur les terres qui l’ont vu naitre : l’Afrique. L’aventure « W.A.K.A » est lancée. Six mois plus tard, malgré d’énormes difficultés, elle atterri au Cameroun, le scénario écrit par Séraphin Kakouang en mains, avec la ferme intention d’aboutir ce projet totalement mené en indépendant. Deux ans plus tard, « W.A.K.A » fait déjà l’objet de plusieurs invitations de Festivals internationaux qui ont rendu hommage à des femmes réalisatrices : JCFA, Burkina Faso, IFC de Douala au Cameroun via la Carte Blanche du Film de Femmes de Créteil, Festival international de la Femme et du Développement à Rabat, Maroc. Surtout, le film a ouvert la 17ème édition du Festival Ecrans Noirs à Yaoundé au Cameroun, a remporté le Dikalo Award d’encouragement 1ère oeuvre de long-métrage à la 11ème édition du Festival international du Film Panafricain de Cannes en France et plus récemment, Francoise Ellong a été accueillie dans la cour des Grands en remportant le Prix Spécial du Jury de la 17ème édition du Festival du cinéma africain de Khouribga, au Maroc. Matilde, in her thirties, is a single woman abandoned by her family and often left to fend for herself. Waitress in a bar, Mathilde sees her life change the day her boss learns that she is pregnant and therefore considers her no longer fit to do the job. Mathilde finds herself faced with a terrible choice: to get rid of her baby and keep her job, or carry her pregnancy to term and cope as best she can to raise her child. The young woman, compelled by a stranger, made the choice of motherhood. But now, since Adam’s birth, Mathilde endures a period of difficulties that will only continue to increase. Finding a job is not easy after losing the previous one. Mathilde wants to resume her job at the bar, but the boss has already hired someone else. This is when Max, a forty-something pimp, enters Mathilde’s life, renaming her Maryline, with the firm intention that she never gets out of it. Mathilde is trapped because she has to pay her bills and most importantly, care for her son. Each day Mathilde becomes Maryline, though never forgetting that she is above all a mother who wants to provide for her child. As Adam grows up so does his curiosity about the activities of his mother. It was because of the stranger Luc that Adam exists. He was love-struck by Mathilde the very night that she was about to swallow the contents of the bottle, which would have allowed her to abort the baby from her womb. Is Luc a blessing or a curse? Matilde, la trentaine, est une femme seule abandonnée par les siens et souvent livrée à elle-même. Serveuse dans un bar, Mathilde voit sa vie basculer le jour où son Patron apprend qu’elle est enceinte et donc en ce qui le concerne, inapte à travailler plus longtemps dans son enseigne. Mathilde se retrouve alors devant un choix terrible : se débarrasser de son bébé et garder son boulot, ou mener sa grossesse à terme et se débrouiller comme elle peut pour élever son enfant. La jeune femme, poussée par un inconnu, fait le choix de la maternité. Mais voilà, dès lors qu’Adam naît, s’ensuit pour Mathilde une période de difficultés qui ne va cesser d’accroitre. Trouver un travail n’est pas chose facile après avoir perdu le précédent. Mathilde veut reprendre son boulot au bar, mais le Patron a déjà recruté. C’est alors que Max, proxénète, la quarantaine, entre dans la vie de Mathilde qu’il rebaptise Maryline, avec la ferme intention de ne plus jamais en sortir. Mathilde est prise au piège, car il lui faut payer ses factures et surtout, nourrir son fils. Mathilde devient alors jour après jour Maryline, sans jamais oublier qu’elle est avant tout une mère qui veut subvenir aux besoins de son enfant. Adam grandit, en même temps que sa curiosité sur les activités de sa mère. L’inconnu qui a permis l’existence d’Adam s’appelle Luc. Il s’est épris de Mathilde le fameux soir où elle s’apprêtait a ingurgiter le contenu de la fiole, qui lui aurait permis d’évacuer le bébé de son ventre. Luc est-il une bénédiction ou une malédiction? The theme of the film was the result of a casual conversation that I had when dining with friends. During the discussion, I hear: "... in any case she is not a good mother." Is there a manual somewhere that follows to the letter what automatically makes one a good mother or not? Or does it depend on each person’s experience? The idea of ​​the film resulted from this. Prostitution is a pretext in the film to talk about the journey and struggle of a woman—both as a woman and as a mother. Do you know any women in this situation? In the neighborhood where I grew up, in Deïdo, there are many. I know some personally and through intermediaries who say that they do not see them as such. We met during the filming and many were able to show their strong character and their desire not to be considered as a scourge of society. Ninety-five percent of the crew was local. The whole adventure took place in a wonderful atmosphere of sharing and superb solidarity. I did not know any of the local actors or technicians. We got to know each other and became a family. We were very supportive of each other during the filming. The Cameroonian audience loved the film a lot! Many were surprised to feel such empathy for a woman that they could have quickly judged or rejected. There were also many viewers who especially liked the way the city of Douala was filmed. They see it differently in the film, more refined than what they would have imagined, far from the constant agitation that is systematically assign to the economic capital. And also, they were moved to see a local film shot in a more cinematic way. But I noticed that my presence at the screening helped many people to grasp the reality of the film. People no longer have the habit of going to the cinema house and do not necessarily have requisite skills to read the different storytelling techniques of film. So they are at a basic level, very much at the surface when reading a film. But when talking with some of the viewers, they realise that they had perceived the message without being able to put a precise term to it or without being able to describe it. Overall the film is very popular and even today it draws a large number of viewers. Le thème du film a découlé d'une conversation banale que j'ai eue à table avec des amis. Pendant la discussion, j'entends cette phrase : "... de toutes les façons ce n'est pas une bonne mère". Est-ce qu'il existe un mode d'emploi quelque part qui suivi à la lettre fait de nous automatiquement une bonne mère ou non? Où tout ça dépend du parcours de tout un chacun ? L'idée du film a découlé de cela. La prostitution est un prétexte dans le film pour parler du parcours et combat d'une femme en tant que femme et en tant que mère. Connais-tu des femmes dans cette situation? Dans le quartier où j'ai grandi, à Deïdo, elles sont nombreuses. J'en connais quelques unes personnellement et par personnes interposées qui disent ne les voir pas comme tels. Nous en avons rencontré durant le tournage et beaucoup ont pu témoigner de leur caractère bien trempé et de leur envie de ne pas être considérée comme un fléau de la société. L'équipe était à 95% constituée de locaux. Toute l'aventure s'est déroulée dans une magnifique atmosphère de partage et une belle solidarité. Je ne connaissais aucun technicien ni acteur localement. On a appris à se connaitre et nous sommes devenus une petite famille. On a été très solidaire durant le tournage. Le public camerounais aime beaucoup ce film ! Ils sont nombreux à se surprendre de ressentir de l'empathie pour une femme qu'ils auraient pu juger ou rejeter spontanément. Ils sont également nombreux à avoir particulièrement aimé la manière dont la ville de Douala a été filmée. Ils la voient différemment, plus épurée qu'ils n'auraient pensé, loin de l'agitation constante qu'on veut bien attribuer systématiquement à la capitale économique. Et aussi, ils sont émus de voir un film local filmé de manière plus cinématographique. Mais j'ai remarqué que ma présence aide beaucoup aux gens à saisir le réel propos du film. Les gens n'ont plus l'habitude d'aller au ciné et n'ont pas forcément les cartes en mains pour lire les différentes techniques de narration d'un film. Du coup ils sont très premier degré, très en surface au niveau de la lecture. Mais en discutant avec certains, ils se rendent compte qu'ils avaient perçu le message sans pouvoir mettre un terme précis dessus ou sans pouvoir décrire. Globalement le film est très apprécié et aujourd'hui encore il réuni un nombre important de spectateurs.